It's one thing to face a Dragon with a longsword and a suit of magic plate mail, but what if you had an atom gun and power armour? How many zombies could you blow away with a rocket launcher? What happens if you are standing next to a graviton reactor when it explodes? 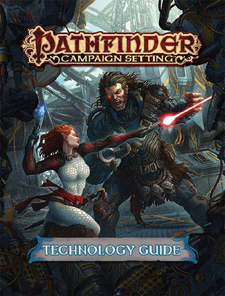 All of these questions and more are answered witin the pages of the Technology Guide - an invaluable manual of items, hazards, and character options for use in science-Fantasy settings like Golarion's Numeria, land of savagery and super-science! Rules for dozens of new technological items, including weapons, armour, force fields, hologram generators, grenades, cybernetic implants, nanotech devices, remote controls for robots, and more. Extraordinary powerful powerful scientific items and artefacts, such as extinction wave devices, powered armour, and nuclear reactors! The Technomancer prestige class, which allows you to use magic to command robots and power your technology. Rules for artificial intelligences, the effects of the passage of time on technological devices, the dangers of radiation, the seven skymetals of Numeria, technological traps, and more.